David Parkhouse opened the scoring for Derry City against Sligo Rovers. DERRY CITY netted twice in the second half as they got back on the winning trail with a battling victory over Sligo Rovers at the Ryan McBride Brandywell Stadium. David Parkhouse continued his goalscoring form from the international break where he netted for ex-Sligo boss, Ian Baraclough's Northern Ireland U21 outfit against Mexico. And Ciaron Harkin made certain of the result on 94 minutes as the Candy Stripes moved into fourth place in the Airtricity Premier Division. 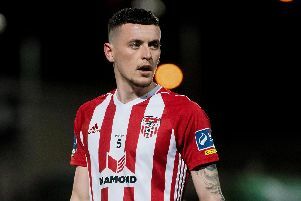 Derry boss, Declan Devine handed goalkeeper, Nathan Gartside his first start in the absence of the injured Peter Cherrie and the ex-Watford man needed to be at his best to turn Liam Kerrigan's blistering effort over the bar in the first half. After a sluggish opening half, Derry clicked into gear after the break and Parkhouse found the back of the net with a stunning finish from distance. As Sligo chased the game, Harkin picked up a pass from substitute, Gianni Seraf and buried his shot into the far corner as City bounced back from their home defeat to Dundalk. It was a frantic start to the contest and Daryle Fordyce flashed a shot on the half volley just wide of Gartside's left hand post after just four minutes. Referee, Tomas Connolly bizarrely awarded a corner before reversing the decision after consulting with his assistant. Barry McNamee did well to keep the ball alive and cut back into the path of Eaghan Stokes who hit the side netting on 10 minutes with a powerful effort. Straight up the other end and Gartside produced an outstanding save to tip over Liam Kerrigan's curling strike from the edge of the box which looked destined for the top corner. Derry were enjoying the majority of the ball and came close on the half hour mark only to be denied by Sligo keeper, Mitchell Beeney. Greg Sloggett found Ciaron Harkin whose deft touch laid the ball into path of Ogedi-Uzokwe. And when the Englishman tried to find the far corner, Beeney reacted quickly to palm the danger away at full stretch. Parkhouse fired an ambitious effort over the crossbar as Derry began to churn through the gears at the start of the second half. Barry McNamee capitalised on a slip by Kyle Callan-McFadden inside the Sligo penalty area but his left footed drive was parried away by Beeney. Stokes was first to react to the rebound but from a tight angle his low strike hit the foot of the post and went behind. Finally the breakthrough arrived for the home side on 59 minutes when Parkhouse picked up the ball 20 yards from goal and sent his low shot into the bottom corner of the net. The Bit O'Red missed a glorious chance to level on 77 minutes when substitute, John Russell got in behind the Derry defence and cut the ball back into the path of Ronan Coughlan who mis-kicked from eight yards as the ball trickled harmlessly wide. There were shouts for a penalty from the home support on 80 minutes when Harkin went down under the challenge of substitute, John Mahon but the referee was well placed and took no action. Russell came so close to hitting the target with a well struck volley from 18 yards which bounced just wide of the post with Gartside rooted to the spot. Harkin then put the game to bed with a brilliant finish from wide on the right as Derry returned to winning ways. Derry City: N. Gartside, D. Cole, E. Toal, A. Gilchrist, C. Coll; G. Sloggett, C. Harkin, B. McNamee (J. Kerr 93); J. Ogedi-Uzokwe, D. Parkhouse (G. Bruna 88), E. Stokes (G. Seraf 73); Subs not Used - D. Houghton, E. Tweed, S. McNamee, R. McKinley. Sligo Rovers: M. Beeney, J. Dunleavy, D. Leverock, K. Callan McFadden, R. Donelon; K. Twardek (R. Parkes 80), J. Keaney (J. Mahon 80), S. Warde (J. Russell 73) L. Kerrigan; D. Fordyce; R. Coughlan; Subs Not Used - L. Nicholas, L. Banks, R. Murray. N. Morahan.